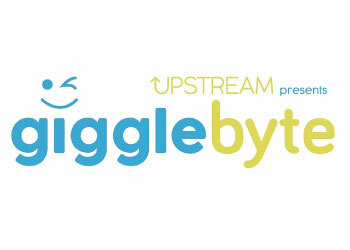 Gigglebyte – 4 days | Over 200 people | 9 Pitches |2 Prizewinners and a lot of laughs. Back when Upstream launched in January, organising a mini business-meets-comedy-festival seemed quite doable and a long way off. 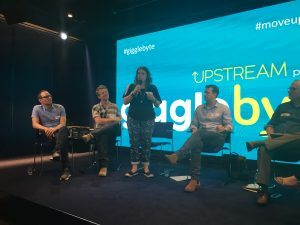 4 weeks ago, pre-heatwave and mid World Cup hysteria, the Upstream team did have a moment where we thought we had taken too big a byte! Yet, thanks to the support of the businesses and incredible brains across the borough – it’s been a pretty special week. Creativity and innovation can come from the most random remark – listen to everyone and explore everything. Keep your childlike curiosity. For a great review of the event – please take a look at Sophie Devonshire’s great article. Big thanks to: Mitsui Stanhope, the team at White City Place and our Chair – Sophie Devonshire, and our panellists Paul Coleman, Steve Cross, Sarah Archer, Steve North and Jeremy Nicholas. What a day – 9 female entrepreneurs with a wide range of businesses spent the afternoon with Sarah Archer, to improve their pitching skills. The transformation was incredible, as some founders had not had formal training before. The audience saw 9 great presentations from impressive, innovative businesses. The winners were Ohne and 2080, with a highly commended to DanceWest. Big thanks to: Huckletree West, Imperial College, White City Place, Nikita Thakrar from Imperial College, Kate Newhouse from Blenheim Chalcot, Chris Corbishley from FFWD Partners, Peony Li from Founders Factory, Nick Howe from NatWest and Sarah Archer for her fantastic workshop. WeWork hosted an excellent networking tips event with business coach and super networker Colleen Schell (who has coached business leaders from Silicon Valley through to Bali). 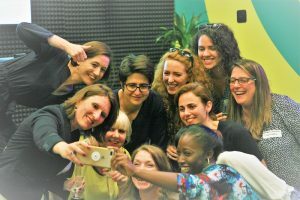 She – is launching a really exciting new 4 week success accelerator for entrepreneurs in September at WeWork.. Find out more about it here. 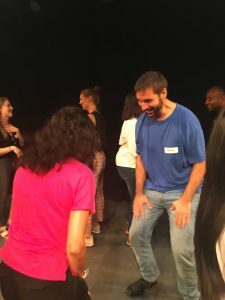 And finally, on Friday lunchtime, businesses from across the borough took part in a improv comedy workshop, designed to show how improv could help business success. Hoopla Business delivered the workshop but it was the attendees that created the wacky, funny and creative stories that brought everyone together! Our attendees were able to see how the skills they are had learnt in just one lunchtime could help improve their communication skills, listening skills and confidence. Listening is key to success! Big thanks to: The Bush Theatre and Steve Roe from Hoopla Business. So, it’s goodnight from me, and goodnight from Team Upstream (to paraphrase The Two Ronnies). We look forward to seeing you at one of our next Upstream events.